Arkle favourite Lalor has been entered in the Grade 1 randoxhealth.com Henry VII Novices Chase at Sandown on Saturday in which at this moment in time he will meet 10 other opponents to try and stake his claim further for the majority of market share in the Arkle. 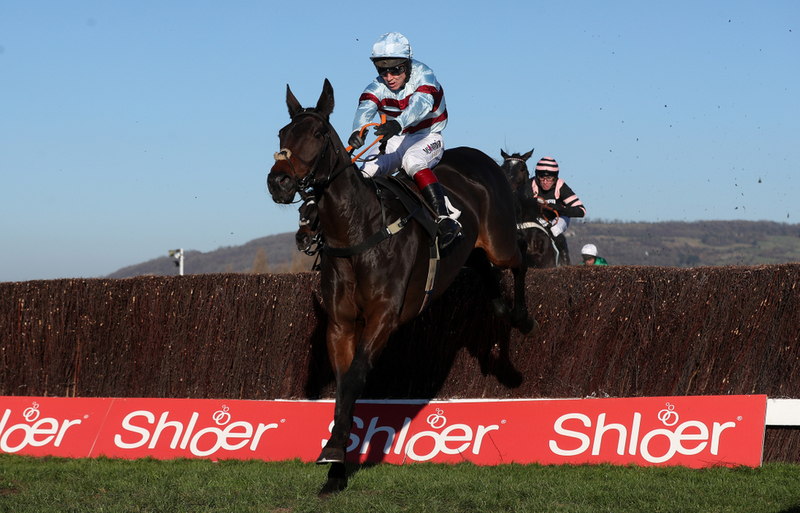 Kayley Wollacott's stable star made a perfect start to life over fences by blitzing the field on his debut at Cheltenham in the Arkle Trial race and was initially ruled out of this black type contest on Saturday but now he will look to take his first Grade 1 over career over fences. The availability of Champion Jockey Richard Johnson is key if we will the six year old as he could be elsewhere with his loyalties to other trainers. (Credit At The Races) Trainer Wollacott said: "I know after Lalor’s win in the Arkle Trial at Cheltenham I said we wouldn’t go to Sandown for the Henry VIII Novices’ Chase, but we’ve decided to give him an entry. “He’s come out of the race in great form and although he hasn’t schooled since, he seems in really good order. It would be silly of us not to enter him and at least have a look at the race. “There aren’t a huge number of options for him, so we’ll weigh things up later in the week and make a decision then. I’m not saying he’ll run, but we’ll definitely consider it. “After Saturday there’s the Wayward Lad at Kempton on December 27, so we could keep him back for that. At this stage we’re then planning to go to Doncaster for the Lightning on January 27 as his final race before Cheltenham. “These things can all change, but we’ll see what the entries look like for Sandown. He’ll school this week and if all is well we could turn up on Saturday. It’s a Grade One after all. Lalor could renew rivalry with Dynamite Dollars, Pingshou and Defi Du Seuil, who finished second, fourth and fifth respectively at Cheltenham last month behind the Wollacott trained gelding.